When the last tram left for Cashmere in 1954, they were superseded by a fleet of English buses. They were one of the finest public fleet anywhere in the world. The great majority of old trams were shipped off to Japan as scrap metal and the cabins became beach cabins or farm sheds. Their passing meant little to the city-dwellers as the vehicles and system were allowed to run down during WWII. However to a few their demise cut deep and were sadly missed .For the most part a great deal of track was simply sealed over with bitumen and forgotten ...almost. In the above picture this track running away to the left of the tram was left exposed for about 500 metres. It was deadly for cyclists as tram tracks were want to be, but the tracks were left that way for over ten years. In the meantime an old horse drawn tram was found and removed where a handful of young men began restoring it; presumably as a static display. It is a long story but someone got the idea that the old track at the top of Papanui Road (above) might be utilised as a week-end tourist attraction. Picture of author and John Shanks 2009. From such an inauspicious beginning this acorn has become not only the Old Village at the original railway site (in NZ) at Ferrymead, but has grown to present the old refurbished trams as not only a tourist attraction but increasingly an inner city means of environmentally friendly people mover. The unintended metamorphosis of dreamers of yester-year to the reincarnation of the past to the present is a lasting tribute to those who sought the impossible and have lived and worked hard enough to see it come to pass. 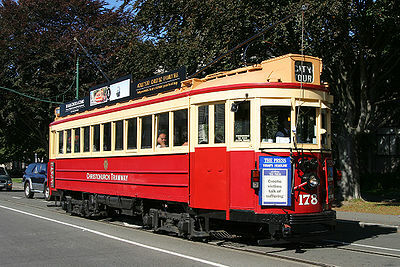 This tram is a lasting tribute to those who worked on its restoration. It is in fact the same tram which you see at the top of the page. What is so remarkable about this restoration is that when discovered there was no transmission, no running gear, no electrics ...in a word it was a skeleton. This has given rise to possibly the finest tram restoration system in the world. Originally these trams were coupled and ran in tandem, but later were modernised and became what were known as 'one man trams'. Most trams in the system employed conductors or 'clippies'. 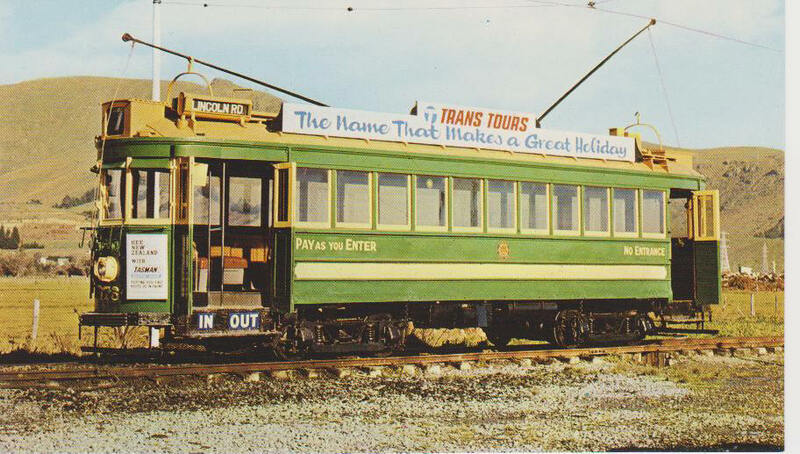 The 'green & white tram is painted in its original livery. 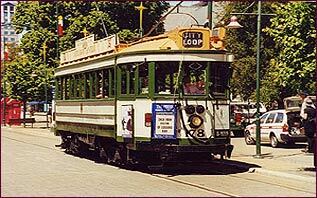 These trams often hauled two trailers behind them and were quite a sight to behold. Today all those years later there are a few who still 'work at the anvil', their capacity, their endurance and their dedication will leave a legacy that future generations will enjoy. As one who was one a participant in this venture I have the greatest admiration for those who served, those who have passed on and those who labour on. The author is trying to move the Christchurch City Council to erect a permanent monument in the heart of the city as a reminder of what these men have given back to their beloved city. To give some insight into the work that is being done I suggest that you follow this link to a remarkable story. Then Navigate to NEWS<click>Tracts Newsletter, View each month. This is a picture of a sister Brill No 174, coming in from the beachside suburb of Sumner. Taken in the 1940's the tram is drawing two tailers.